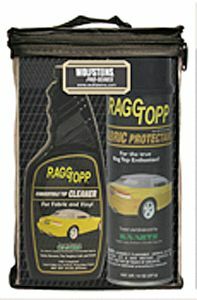 Buy both the RaggTopp Cleaner and the RaggTopp Fabric Protectant in a Kit! Both formulas are the only products recommended by Harrtz Corporation, the world's largest manufacturer of convertible top material. For: STAYFAST®, TWILLFAST®, SONNENLAND® and other Solution Dyed Acrylic Topping Fabrics. The Haartz Corporation recommends using RAGGTOPP™ Cleaner and RAGGTOPP™ Protectant. Although the fabric does not promote mildew growth by itself, mildew may develop on dirt and other foreign substances that are not removed. This is especially true in warm, humid, dark environments. A program of keeping the fabric clean through regular washings (BEFORE it gets dirty) will enhance the life and beauty of the acrylic dye and make successive cleaning easier. Most automatic car washes will not harm cloth top fabrics. Washes with water jets and hanging cloths provide a more gentle cleaning action. Those using heavy barrel brushes could damage the top material. All car washes will remove fabric protection. Haartz recommends hand washing. Hand washing in shade or partial shade, not direct sunlight, is best. DO NOT USE STRONG DETERGENTS. Bird and tree droppings, as well as other loose particle soils, should be removed immediately. Vacuum with a brush attachment and rinse thoroughly with water to remove loose particle soils. This will also prevent the soils from being redeposited during the cleaning process. Once the fabric has been rinsed thoroughly, spray RAGGTOPP™ Cleaner evenly over the entire surface while still wet. Allow the cleaner to soak for 10 to 20 minutes and then scrub lightly with a soft nylon brush or terry cloth rag. Rinse thoroughly, preferably until no remaining soap foam is observed. Additional cleanings may be required. It is best to determine the need for additional cleanings after the fabric has dried completely. For heavy stained white tops, mix a solution of no more than 1/2 cup (4oz.) bleach and 1/4 cup (2oz.) RAGGTOPP™ Cleaner per gallon of water, soak for approximately 20 minutes and scrub lightly as indicated above. (Excessive soaking with the bleach solution can deteriorate seam threads.) Rinse thoroughly to prevent streaking on painted and chrome surfaces. Several cleanings may be necessary. Once dry, cleaning must be followed by re-water repelling with RAGGTOPP™ Protectant. (This product does not contain CFC's and therefore, is not harmful to the environment.) Failure to apply will result in rapid re-soiling of the unprotected fabric.